Dan Jones’ Flickr stream shows off his assemblage sculptures of retro robots ("Tinkerbots"), Rayguns, Vehicles, and other things of equal niftiness. 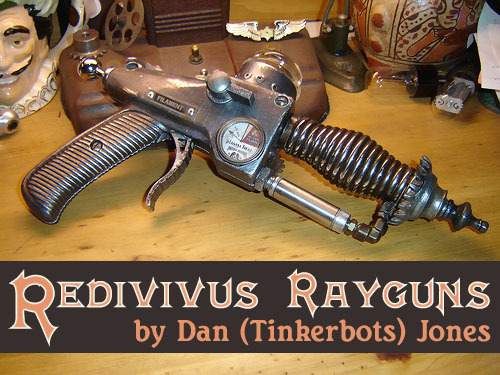 I spent most of my time there on the Redivivus Rayguns, though, because I think they’re not those rayguns that we have, but those rayguns that we deserve. At the top of this post you see the Vintage Plasmablast (and, oh, those modern Plasmablasts just can’t compare) while at the left are the Pneumatic Aetheric Disperser, along with the TZ~24 Sanitizor and the T-39 Delano, which is my personal favorite. They’re all, or should be, the products of Tinkertron Weapons Industries. By way of sculptor Dan Jones. Assemblage sculptures like these hit a sort of aesthetic sweet spot with their worn, vintage industrial parts that combine so perfectly with our worn, vintage industrial futures. That Sanitizor just looks like it was always meant to look that way. Which, coincidentally, is the best way to use a Sanitizor. You yell "Look that way!" and, when they do, you lose no time in Sanitizoring the heck out of them. Or, anyway, that’s what I do. 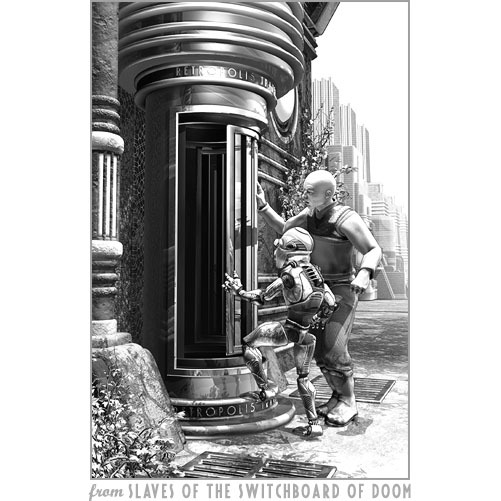 My query for Slaves of the Switchboard of Doom is doing almost exactly what we see Rusty and Harry Roy doing up above in the book’s illustration for Chapter Four. It’s knocking on select and enviable doors throughout New York, looking for a home. Except that’s not what they’re doing, and they’re not in New York, and unlike New York, Retropolis is not populated entirely by literary agents. But otherwise, yep, pretty much exactly like that. Agency #1 read the manuscript and sent back just about the most positive rejection you could ask for, if that’s something you wanted to ask for. And that was nice, considering I’ve started with agents whose boots I am not fit to. . . etc. In fact this was much better than I’d expected and it proved a pretty good test of the book’s query letter. Agency #2 is more elusive and may be very protective of its boots or, possibly, goes barefoot. Today the query’s been unleashed on Agency #3. No news yet on their footwear over there. As I mentioned earlier, I’m working through quite a short list of agents while I work on the illustrations. Over the past few days I modeled several robot heads, and a body for one of them. This book is just lousy with robots. That means I’ve got several more to build. So: busy me, busy query letter, and in general, business. Or busyness. Or something. And boots, apparently. 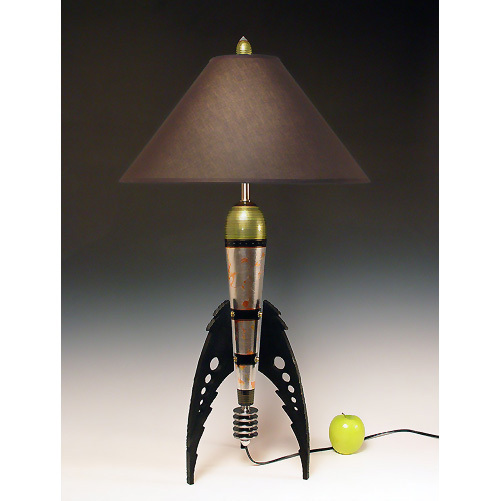 Today, like most days, is Retro Rocket Day here in the Secret Laboratory, and what you see above is something I’d sure like to see in here with me: it’s a fantastic rocket lamp, one of a series that’s available from Etsy seller highdesertdreams (Frank Luedtke & Lin Mullins). In fact… I’d like them all, I think. Why practice moderation at a time like this? Made mostly of different woods and metals, and finished with acrylic paint, these hail from Arizona: a state of wide open skies, clear views of the galaxy, and (now) of lamps that look like they could take you out there. Me, I’d just like to read a book by their light. But I may have diminished expectations. Today seems to be a day for rockets. 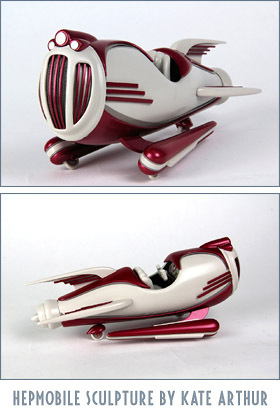 My other discovery of the afternoon tickles me especially because as we see on the right, DeviantArt artist Kate Arthur has made a miniature model of my Hepmobile rocket from Retropolis (notably, Gwen Hopkins’ ride from Trapped in the Tower of the Brain Thieves and The Lair of the Clockwork Book). This one’s a styrene and acrylic sculpture. I can’t tell you how big it is (though I wonder) but I’m pretty sure it’s not full size. The Hepmobile is the VW Bug or Morris Minor of Retropolis. They’re simple enough that just about anybody can keep one running, and they last forever, so long as you remember to tighten the baling wire from time to time. It’s nice to see this one so shiny and new. You can see three views of Kate’s version here, and here, and here.